The Department of Health has appointed Scott Watkin, a Special Olympics athlete, to champion people with learning disabilities. Watkin has been made co-national director for learning disabilities and succeeds Nicola Smith in the role. Watkin has won medals for the 200 metres and standing long jump at the Special Olympics and was previously chair of the Isle of Wight learning disability partnership board. He played a key role in restructuring the board in anticipation of Valuing People Now. The final Valuing People Now strategy was published in January. Watkin’s remit will be to represent the views of people with learning disabilities and speak on behalf of government to people and organisations representing service users and carers. 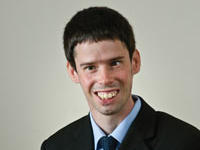 He will work alongside national director for learning disabilities Anne Williams. The DH said Watkin would involved with the government’s new learning disability programme board, set up to co-ordinate delivery of Valuing People Now, and take a lead in its policy of developing strong and effective advocacy services. The DH said Nicola Smith, its first co-national director, made an “excellent contribution” to implementing the Valuing People agenda – the precursor to Valuing People Now – and raised the profile of issues for people with learning disabilities nationally.